This recipe for Sweet and Sour Crockpot Spareribs has so much rich flavor. If you like this recipe, remember that you can make extra batches of the barbecue sauce and store it in the freezer to make it any time. In fact, double or triple the sauce recipe every time you make it and you'll soon have a large batch ready for any grilling recipe. This is a classic barbecue sauce with tons of flavor. You can make this recipe with country-style ribs, which have more meat, or baby back ribs if you prefer. If you brown the ribs under the broiler after they are cooked the glaze becomes sticky and sweet and the ribs are browned to a luscious color. Serve this simple recipe with some roasted potatoes, a fruit salad made with the best fruits of the season, and some sliced tomatoes with basil in the summer (a salad of cherry tomatoes in the winter is perfect). For dessert, brownies or a wonderful and easy chocolate cake are perfectly decadent finishing touches. Mix the brown sugar and flour in a large saucepan. Add the water, then add the vinegar, soy sauce, garlic, ketchup, tomato paste, honey, Dijon mustard, ginger, salt, and pepper. Cook and stir over medium heat until boiling. Simmer for 5 to 10 minutes until the sauce is thickened. Layer the ribs with the chopped onions in a 4 to 6-quart crockpot, spooning the sauce over each layer. Cover the slow cooker and cook on Low for 10 to 12 hours or on High for 5 to 6 hours or until the ribs are very tender and glazed and they register at least 160°F on a meat thermometer. At this point, you can remove the ribs and place them on a broiler pan. Brush with some of the glaze from the slow cooker and brown under the broiler until dark brown. While the ribs are browning, put some of the sauce in a small saucepan and boil until thickened and reduced. 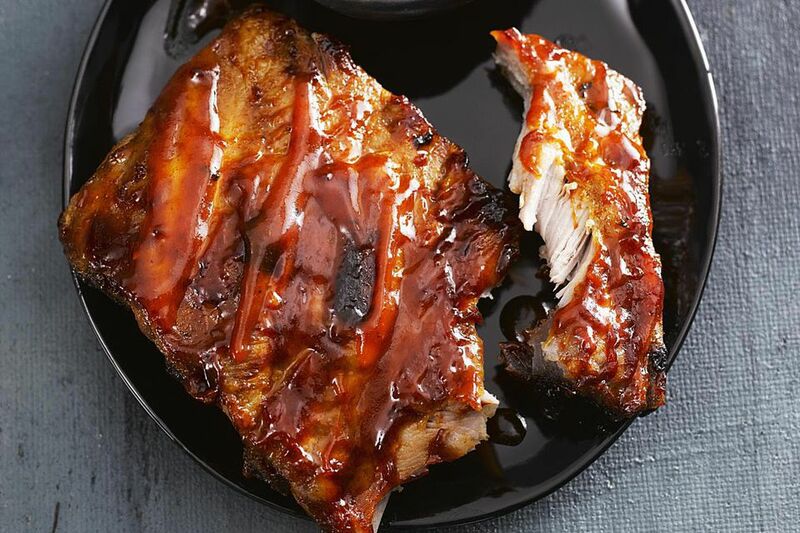 Serve this sauce with the ribs and lots of napkins!